"Everyone loves karaoke. It doesn't matter if you're a professional karaoke performer, an aspiring singer who uses karaoke machines to practice, or a tipsy patron at a bar singing your heart out. There's some kind of karaoke for everyone – as long as you have the right karaoke machine!" This is one of the best karaoke machines I’ve used, period. It’s honestly more of an all-in-one PA system than strictly a karaoke setup, but it serves as a fantastic karaoke machine either way. The PA system aspect is really a bonus – the ION Audio Block Party is definitely the most versatile system I’ve reviewed. It features a 50 Watt / 106 decibel speaker, which can blast audio out to the far corners of even the largest rooms and venues with ease. 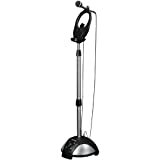 It’s completely bluetooth compatible – which many other premium karaoke machines do seem to lack – and also comes with a standard auxiliary hookup so you can plug smartphones, iPods, mp3 players, and just about any other audio payer in quickly and simply. From an aesthetic point of view, the unit is housed in a fairly nondescript black casing – other than the half disco ball embedded in the top of the system, of course. The disco ball may seem a bit cheesy at first, but it’s a surprisingly high quality addition. It’s basically a complete light show solution built into your karaoke machine. The disco ball can project lights in time with the music, and you can actually download a separate app that affords you very granular control over the scope of the light show. The unit obviously comes with a standard A/C adapter so you can plug it in wherever you go, but it also includes an amazing rechargeable battery that promises up to 75 hours of power (depending on how heavily you use the system, though). You can get the whole thing with wheels and an extendable handle to boot, which makes it super easy to wheel this thing wherever you might need it. Overall, the ION Audio Block Party Live is definitely a more professional / premium solution for your needs. It is ultimately one of our top rated professional karaoke machines. Don’t let that deter you if you’re a home user, though – this thing is perfect for karaoke enthusiasts of any level. This MKS-SS2 unit is actually rather rare in the world of karaoke machines. Rather than the typical speaker box + attached microphone setup, the Memorex MKS-SS2 is a completely integrated unit. It’s designed as a microphone stand setup, with high powered speakers built into the base of the stand. These speakers – called “amplified speakers” by the manufacturer – really are no slouch. The speaker’s strategic positioning in the base of the unit allows for fantastic acoustics while performing, and all audio output is loud but crystal clear. You may need to invest in more powerful, external speakers if you’re a bar owner looking to make use of the MKS-SS2, but the built-in speakers are perfect for any home user out there fresh out of the box. As for music input, the Singstand comes with a standard line-in hookup that fits any device with a headphone jack – that’s basically any smartphone, iPhone, or media player out there. The Microphone is clipped on to a one-size-fits-all cradle that does a great job of holding your audio device of choice while in use. Another great features of this karaoke setup is the “Audio Voice Control” feature it comes with. This “AVC” integration automatically balances the output of your voice with the output of whatever song you’re singing over, so that you’re not drowned out by the music and vice versa. This is a really cool feature – I’m sure you’ve all heard “loud” and “quiet” singers, and neither one is especially fun to listen to. The 59-inch microphone stand is perfect for performers of all heights, and the mic itself is of superb quality. As another bonus, there is also an “Instrument Input” hookup that’s compatible with guitars, keyboards, and most other instruments out there. You can plug in and play along while the singer sings, or you can just use the system as an AMP and practice your music whenever you want. The Electrohome EAKAR300 is without a doubt one of the most popular karaoke setups out there. Electrohome clearly wanted to make a simple yet comprehensive home karaoke solution, and I have to say they did a fantastic job with this little unit. From a family perspective, the EAKAR300 ticks every box – it’s lightweight, portable, durable, but also quite powerful when it comes to audio input options and it’s built-in speakers. This unit really has two different “modes” – standalone, and as an integrated part of your home media setup. As a standalone karaoke machine, the EAKAR300 has a built-in CD player that can take advantage of CD+G discs (audio discs with encoded graphics, so you can have lyrics displayed on-screen as you sing), a standard aux jack so you can hook up your smartphone, iPod, or mp3 players as an audio source, and dual microphone inputs should you want to break out the duets. The unit does have integrated speakers as well, which definitely perform at an acceptable level given the unit’s size and affordability. That all being said, this Electrohome karaoke setup shines even more so when you hook it up to your TV or computer via the included RCA cable. You can now take advantage of huge on-screen lyrics and powerful external speakers to enhance your karaoke experience, with the EAKAR300 serving as a centerpiece that routes audio and accepts microphone inputs. The unit also comes with a neat Audio Voice Control features, which tries to detect when you’ve forgotten a line or lyric, and will automatically play the forgotten line from whatever song you’re singing. This AVC does only work with certain media input types, however. Overall, the EAKAR300 really is one of the best home karaoke setups out there, and you won’t be disappointed by the little guy’s awesome performance capabilities. Essentially, the Singtrix setup is based around integrating professional-grade vocal effects technology into the karaoke process. Plenty of karaoke machines boast “voice correction” technology or “automatic pitch control,” but the Singtrix technology blows all other attempts out of the water. The system includes over 300 unique vocal effects, and comes with natural pitch-correction, HardTune (think AutoTune), 4-part harmonies and choir effects, more voice morphing capabilities than you can shake a stick at, gender-switching effects, and much more. The system is definitely one of the most “modern” karaoke setups as well, and it comes with all of the bells and whistles you could want – it can play YouTube videos as karaoke tracks, mp3 music, smart phone audio, computer audio, tablet audio, and more. You can even plug in an instrument and sing along to live music, or just use the system to practice your guitar! The included microphone is proprietary, and features even more vocal controls available at the touch of a button. The entire Singtrix setup aims to make you feel like a true rockstar, performing in the biggest concert venues of all time. The price point can definitely be a little heftier than many other karaoke options out there, but for good reason. You won’t regret the luxury karaoke experience afforded by this awesome Singtrix system. What’s karaoke without a live instrument accompaniment? Take your performance to the next level by singing along with some power chords from an electric guitar, or slow everything down and sing a soulful tune backed by live piano work. Check out our electric guitar reviews and our digital piano reviews if you’re looking for more info about either instrument! My name is Thomas Boxtiger, and I’m a big karaoke enthusiast. I know I’m not going to be the next Justin Bieber, but that’s never stopped me from getting up in front of some friends and belting out Rock Lobster at the top of my lungs. I’ve been into karaoke since I was young, too. I started with a kid’s karaoke machine years ago, and ended up today with one of the best home karaoke machines that has all the bells and whistles. Luckily for you, that means I know a good karaoke machine from a bad one. I’ve tested out quite a few karaoke units over the years, and I decided it was finally time to write my thoughts down to help other people buy the perfect karaoke machine for their needs. Read my Karaoke Machine Comparison Chart below to instantly compare my favorite models! I only post high quality, comprehensive karaoke machine reviews on this site. Karaoke machines are more involved than you might think, and I want to make sure you’re getting your money’s worth when you decide to buy one. There’s a lot to consider: Build quality, microphone quality, speaker quality, type of machine, accessories and more are all things you need to take into account when deciding on the perfect unit for you. Every product reviews on my site is first subjected to comprehensive and rigorous testing – I try to find the weak points and push on them until something breaks, so you know exactly what you’re getting when you purchase a product that has the Boxtiger recommendation behind it. Occasionally, you’ll notice me say “we,” or “us” – while I do own this website, I have a large network of professional musicians, audio equipment guys, and more that I reach out to on occasion. If there’s a popular product model out there that I haven’t personally tested, I’ll find one of my friends or colleagues who has used it, and ask them to write up a review for me. That way, you all get first-hand experiences with every single product listed on my site. I do have an extensive testing process in place for the best karaoke machines specifically, and I’ll be outlining it in this section in the coming weeks. The below Karaoke Machine Comparison Chart has been put together to help you easily find my ratings for all of the karaoke machines that I have reviewed. I give each karaoke machine a total score of between 1 and 10. The higher the score, the better it rates; as determined by 4 primary metrics such as Affordability and Sound Quality. If you’re on my site you probably know what a karaoke machine is, but we’ll start with the easy stuff anyway before diving into the more technical info. A karaoke machine is a machine that lets you perform like the greatest singers of all time. You can pick any one of the many songs that come with the machine, and then you sing along with the lyrics using a real microphone. Some karaoke machines grade you on your performance compared to the original, and some just display song lyrics on your screen along with the rhythm and timing of the song. 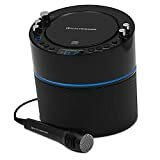 Why Buy A Karaoke Machine After Reading My Reviews? I love singing, so I’m a bit biased, but a karaoke machine is one of the most entertaining purchases you can make. Deep down, everyone wants to be a star – karaoke lets you be one of the greats for as long as you want! You can be Justin Bieber, Ariana Grande, Elvis Presely, and Shania Twain all in one sitting. It doesn’t matter if you like rock, pop, hip hop, rap, country, opera, or any other genre of music. You can be whoever you want and sing whatever you want with a high quality karaoke machine – and that’s where my reviews help! Karaoke machines are also perfect for fun with friends and family. Some of my best memories were made sharing the microphone with someone I care about and singing our hearts out together. It’s almost like magic – if you have a karaoke machine, your house is the place to be! On the other hand, karaoke machines are also perfect for aspiring singers. Some of the best singers in the world got famous in part because they spent hours and hours practicing their singing with the help of a good karaoke machine. If you know someone who wants to be a singer, there’s no better gift than a karaoke machine. Lastly, karaoke machines are perfect for entrepreneurs looking to get started with their own business. Everyone in the world has been to a neighborhood party or holiday get together that had a hired DJ with a portable karaoke machine. If you have a decent karaoke machine and some good sound equipment to go with it, people will pay very good money to hire you for a few hours! I do this on the side and it’s way too much fun to be considered a job. Who wouldn’t want to be in charge of the karaoke machine at a huge party where everyone’s laughing, singing, and having a fantastic time? There really is no wrong reason to buy a karaoke machine. No matter what you end up doing with it, you’ll be making yourself and other people happy. Let’s get started on my karaoke machine reviews, by identifying the different types of karaoke machines! Socialization; You can’t help but be more social when you’re the proud owner of your very own karaoke machine! Whether you’re practicing in front of your family or with friends, karaoke machines bring people together in a way that is quite simply fascinating. Entertainment; I honestly don’t think I’ve gotten more entertainment out of a single device than I have from a solid karaoke machine. The possibilities – and the hours you’ll spend exploring them – are endless! Memories; It’s a fact that karaoke machines have contributed heavily to some of my most prized memories throughout life. You might laugh, you might cry, and you’ll definitely sing your heart out – the memories you make while singing karaoke will last a lifetime. Friends; You’ll make more friends if you own a karaoke machine. You just will – people can’t resist the allure of a stage and microphone, no matter how small or large the audience is. Fame; You never know! Practice enough and you could find yourself or a loved one making it big one day. Talent; Improve your musical talent across the board. Singing goes hand-in-hand with playing a digital piano for example! There are four general types of karaoke machines that I cover in my karaoke machine reviews: kids karaoke machines, home karaoke machines, portable karaoke machines, and professional karaoke machines. It’s important to think about which type of machine suits your needs best. They all bring different strengths to the table, and you want to make sure you’re spending your hard-earned money as wisely as possible. These karaoke machines usually feature all-in-one setups – you don’t even need to plug them in to a TV or anything else. Kids karaoke machines typically come with the screen and microphone built-in, along with any controls you might need to operate the unit. They’re usually smaller and very portable, and they come with a selection of songs pre-loaded for easy use. Many kids machines also let you expand the song catalogue with a USB drive, and some might come with a disc drive built in so that you can simply pop disc in if you want more songs to sing. Some of these do require an external power supply like a wall outlet or generator, but many of them are battery powered as well! Kids karaoke machines are usually the cheapest, most affordable options out there. Most of them are decorated in a certain theme and are perfect for kids who have a favorite cartoon show, singer, etc. When I was little, for example, I had one that was plastered with guitars and other awesome rock star graphics! View the best kids karaoke machines! These units tend to be more complex and you can pick from a very wide range of features and capabilities. Some home machines do come with their own screens but most of them require you to plug them into a TV to view the lyrics. Plenty of home units come with a speaker built in, but these speakers can be very low quality. It’s usually a better idea to plug the machine into a dedicated sound system as well as a TV. These connections are “plug and play” and are very easy to figure out – they’re typically simple “component” connections, although some newer karaoke machines can feature HDMI inputs instead. With a home karaoke machine, it’s incredibly easy to expand the selection of music you have to pick from. Most of them are essentially glorified DVD players, so all you have to do is buy an “expansion” CD with thousands of additional songs on it. Because of this, most home machines also double as fully functioning DVD players! This is some very nice added value, especially if you’re in need of a spare (or primary) DVD player to begin with. Most home karaoke machines come with dedicated, professional-grade microphones for you to use. Plenty of units do come with multiple microphones too, or at least allow you to use more than one microphone at the same time.This is perfect for duet performances, and really lets you get the most out of your karaoke machine. A lot of these units allow you to record your performances, which is pretty cool too. That way you can go back and critique yourself and your friends, use your vocals in other capacities, or simply listen to your singing again because it was just that good! View the best home karaoke machines! Portable karaoke machines allow you to transport them at will, but can also be easily integrated into home TV and audio systems when possible. You can think of them sort of like laptops – you can use them wherever you are, but you can also plug them into bigger and better hardware setups when you have the luxury of doing so. True portable karaoke machines come with high quality, built-in screens, speakers, microphones, and controls so that you can set them up and use them anywhere you want. Many portable units do still require a dedicated power source, such as a wall outlet, however. The built-in components will never be as good as a dedicated karaoke setup (TV, audio system, etc) will be, but the more expensive portable karaoke machines do come with excellent alternatives. The high-end portable machines are more than capable of serving as the only speaker needed for events, unless the venue is absolutely huge. These portable units are often the ones that DJ’s travel with when they get hired for shows, weddings, parties, and so on. You can also buy plenty of accessories and peripherals to really enhance the quality of a portable karaoke unit, like a stand to elevate the screen and speaker, extra audio components, better microphones, and so on. View the best portable karaoke machines! While most karaoke machines come with everything you need to get started and singing ASAP, there’s always room for upgrades and accessories that will make your karaoke experience even more enjoyable. Almost every karaoke machine out there comes with a microphone to start – they’re not much good to anyone without one, after all. Unfortunately, plenty of karaoke units come with poor quality microphones that don’t do a good job of picking up your voice, break easily, or both – and that’s why it’s imperative that you thoroughly read through my reviews. Luckily there are plenty of alternative microphones out there for you to pick from. All you need to do is determine whether your karaoke machine is compatible with a wired or wireless microphone, and then ensure that the new microphone you buy is also compatible with your karaoke machine. Plenty of karaoke machines come with screens built-in – like many kids and portable units – but these screens are often low quality, hard to read, and won’t last long before they start breaking. You don’t want to be stuck with a karaoke machine but unable to read the lyrics, so it’s important to invest in a sturdy, high quality screen or monitor that you can use with your karaoke machine. When buying a different screen or monitor for your karaoke machine, it’s important to make sure that the input/output types of the screen and karaoke machine match up! Most karaoke machines come with some sort of built-in song catalogue, but if you love karaoke as much as I do you’ll be bored and wanting new material before long. Some machines will connect directly to the Internet (or through your computer) and allow you to download and store karaoke machine songs directly on their internal memory. On the other hand, some karaoke machines come with USB slots or disc drives and require you to transfer songs via a USB stick or to buy new songs on a compatible disc or DVD. It’s important to make sure your new songs are in the right format for your specific karaoke machine. Otherwise, you might be able to hear the music but not see the lyrics, or vice versa.